Labour leader Jeremy Corbyn has said that another referendum on Scottish independence would be "absolutely fine". Nicola Sturgeon has repeatedly warned a fresh vote is "highly likely". But Scottish Labour leader Kezia Dugdale has said her party would oppose any attempt to hold a referendum. However, Mr Corbyn told the Press Association it was not the job of Labour "to prevent people holding referenda". Senior Scottish Labour figures have strongly condemned Mr Corbyn - with the party's justice spokeswoman, Jackie Baillie, describing his comments as "misguided and irresponsible". She added: "They are an insult to the dedicated work of Scottish Labour MSPs, councillors, and thousands of activists who have campaigned against a divisive second referendum." Labour's only MP in Scotland, Ian Murray, tweeted that Mr Corbyn was "destroying the party" - but Ms Sturgeon, the Scottish first minister and SNP leader, tweeted that it was "always a pleasure to have Jeremy Corbyn campaigning in Scotland". Mr Corbyn's remarks come amid speculation that Ms Sturgeon is about to demand a Section 30 order from Westminster, allowing another legally binding vote on Scotland's place in the UK to be held. Prime Minister Theresa May has so far avoided saying whether or not she would grant permission - instead saying only that she does not believe a second referendum should be held. Mr Corbyn suggested he did not think Westminster should seek to block a referendum, and was quoted by PA as saying that Labour "wouldn't block it". He added: "If a referendum is held then it is absolutely fine, it should be held. I don't think it's the job of Westminster or the Labour Party to prevent people holding referenda." He also stressed the importance of the economic ties between Scotland and the rest of the UK, and on the issue of further devolution stressed any new powers transferred north as a result of Brexit should go further than just Holyrood. Mr Corbyn said: "I do think we should set it within the context of the economic relationship with the rest of the UK and the question of devolution of EU to English regions and to Scotland, and to parts of Scotland rather than just to the government in Holyrood. "The principle of regionalism is it goes to everybody within a region, not just to the central powers and the SNP have a bit of a tendency to centralise things around themselves." A spokesman for Mr Corbyn later told the BBC: "Jeremy reaffirmed our position today that if the Scottish Parliament votes for a referendum, it would be wrong for Westminster to block it. "Labour continues to oppose a further referendum in the Scottish Parliament and would campaign against independence if one were held." 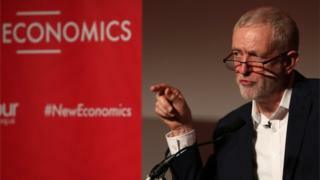 Mr Corbyn was speaking ahead of a speech to Labour's economic conference in Glasgow. His comments appeared to echo those of former Liberal Democrat leader Nick Clegg, who told the Herald newspaper that it would be "very difficult for any government of any composition in London to try and impose a fatwa on any move towards a referendum, if that was something which was being pushed, however unwelcome that is." However, Scottish Lib Dem leader Willie Rennie told ITV Borders that the party would vote against a referendum in both Holyrood and Westminster. SNP MSP Stuart McMillan said Mr Clegg and Mr Corbyn had "both recognised the Scottish government's cast-iron democratic mandate for a second independence referendum if that is the chosen route to protect our national interests." He added: "This was a specific manifesto commitment on which the SNP was re-elected just 10 months ago. "Scotland voted clearly and decisively to remain in the EU: not for an economically disastrous Tory hard Brexit outside the Single Market, and yet Lib Dem and Labour MSPs will happily sit on their hands and let that happen. "It's embarrassing that Lib Dem and Labour in Holyrood want to deny Scotland the opportunity to avoid a damaging hard Tory Brexit while Corbyn and Clegg agree that it would be wrong to block Scotland having a choice on our future if that is what is needed." Scottish Conservative chief whip John Lamont said: "Jeremy Corbyn clearly doesn't understand that most people in Scotland don't want another divisive referendum. "A second referendum on independence should not take take place and, unlike Mr Corbyn, the Scottish Conservatives will not support the SNP in making it any easier to take place. "The less he says on this issue, the better."